QuikStrike puts a lot of information at your fingertips, and it’s important to know exactly what you’re viewing. Navigate to the QS.EDU tab and click the Contract Specs → Product Properties page to find tick data and scaling factors for an entire product group at a glance. The information on the page is separated into Options, Futures and Scale Factors sections. It’s important to note the Tick Amount and Tick Values in each section. Tick Amount represents the minimum movement in price for a product, while Tick Value is the cash value of each tick. 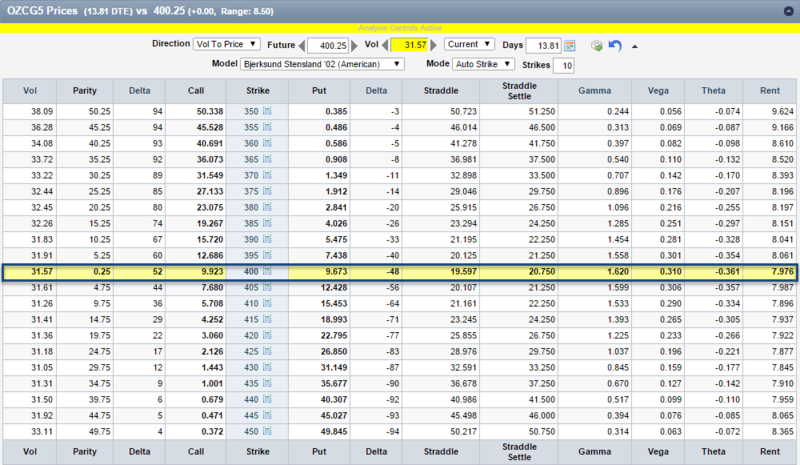 For example, Eurodollar options move in .01 ticks, so each tick is worth $25 (see the image below). Tick Size and Tick Values won’t be the same for all products and product groups. Below is an image of the US Rates Product Properties page. Take a look at the the Premium/Point column. This number shows you how much traders would make or lose on a 1 full point move in the option. 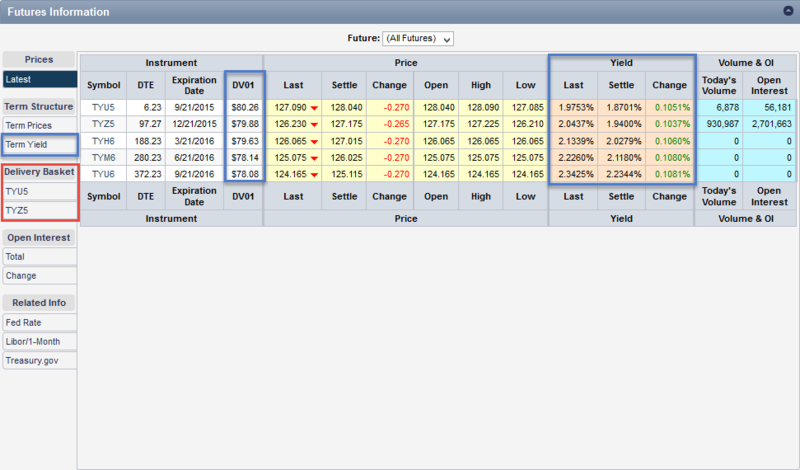 In our Eurodollar option example, if the price moves 100 ticks (1 point) a trader would make/lose $2,500. Don’t forget that Scale Factors are used to scale the output of the pricing models for display. For example, if the Delta of an option was .42, QuikStrike would multiply that number by 100 to get 42, and that’s how it is represented in the application. You’ll see that the Premium Multiplier column is starred. To convert the premium from ticks to currency, multiply the premium value by the number in this column (NOTE: QuikStrike presents premium value in ticks). It’s important to remember that this is the US Rates Product Properties page. 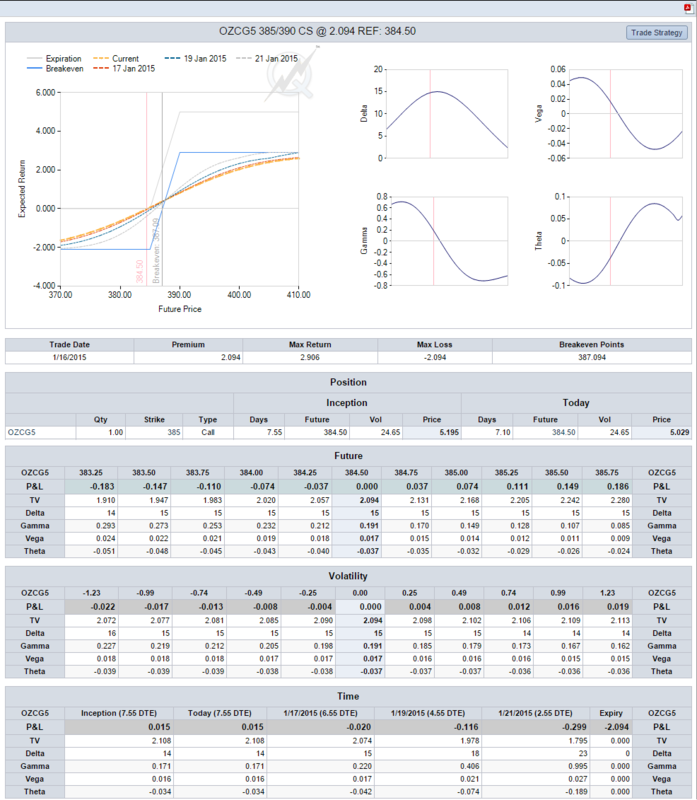 Take some time to look at the Product Properties page for each product group to get acclimated with the Tick Amount, Tick Value, Premium per Point, Premium Multiplier and Scale Factors for all individual products you trade. Come to this page in QuikStrike to find out the value of an option and what model is being used to price it. We hope this blog post clears up any questions you may have about our Product Properties page. Please get in touch with us if there is anything else you can help us with. Thanks for taking the time to read our blog! Launch this popup from (almost) any page in QuikStrike. Don’t forget to hover over the graphs and charts in each tab of the popup to view specific information. The Strike Detail popup allows users to access information about a particular strike price, expiration or future price without navigating from their current page. Please let us know if there is anything you would like to see us add to this popup, or any of our other popups within QuikStrike. Feel free to add a comment below, shoot us an email (info@quikstrike.net) or tweet us. If you’ve read the blog post about our Standard Pricing Sheet, it’s time to try out our Strike Detail Sheet. Now that you know how to find call, put and straddle prices, view Greek values associated with those positions and manipulate inputs in a theoretical pricing model, you can apply that knowledge on this more advanced page. Select a strike price from the Strikes column on the left hand side to get started using the Strike Detail Sheet (NOTE: The page will always open with the ATM strike selected). Use this page to find information for strikes and multiple trade types, including Spreads, 1x2s, Flys, Trees and Ladders, Condors, Iron Flys and Strangles (NOTE: To learn more about the trade types on the page, visit the Trade Examples tab in the QS.EDU section of QuikStrike). You’ll notice that the strike width increases in each group of spreads as you move down the line. Look at 1x2s, for example. The 385/390 spread is one strike wide, while the 385/405 spread is four strikes wide. As you can see on the above chart, the Strike Detail Sheet has the same Analysis Bar as all other pricing sheet pages in QuikStrike. Manipulating the Future Price, Volatility (or ATM Price) and Days to Expiration (DTE) will alter the the calculations in the table. Users have the opportunity to see how a change in one of the inputs can affect the Premium Price, Delta Position and Change between the premium price and previous settlement prices for all the common spreads on the table. Don’t forget about the Mode and Direction dropdowns within the Analysis Bar. The Mode allows you to view a specific range or group of strikes, while you can toggle the Direction from Vol to Price to Price to Vol. Did you notice that almost every value in the table changed? Adjusting each input will affect the values in the table in different ways. Clicking on the strike prices in any of the spreads will launch a Trade Strategy popup that contains Greeks data, Premium information, Profit/Loss tables and an Expected Return chart. Underneath the chart, you’ll find graphs for all the Greeks. 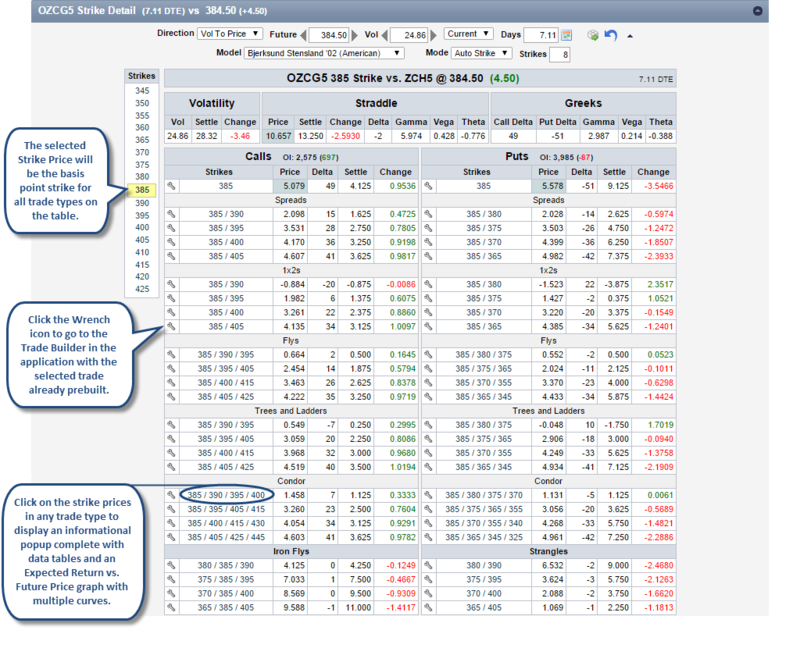 Hovering over the curve on each graph allows users to view Greek values with corresponding future prices. 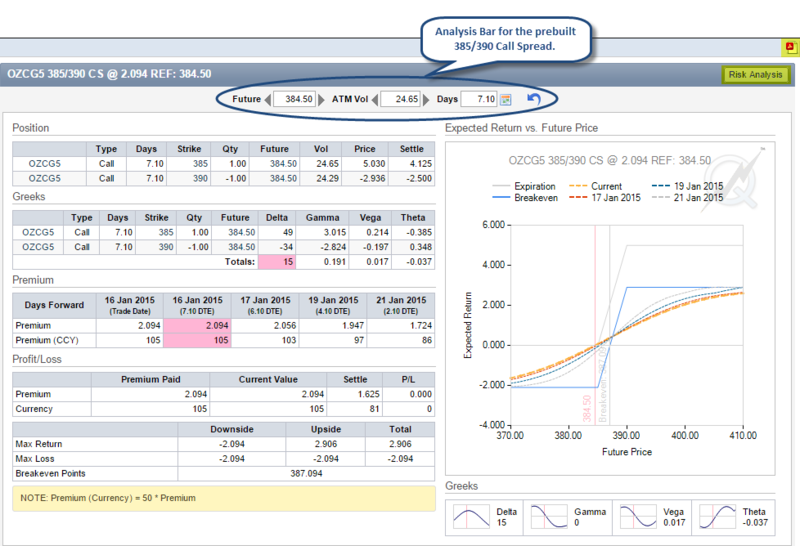 The popup in the image below displays a 385/390 Call Spread (NOTE: The current values for the the spread are highlighted in pink). It’s important to note the Risk Analysis button and the ability to save the page down to your machine as a PDF. The image below shows the Risk Analysis page which has the same Expected Return and Greeks chart on the Trade Strategy page. In addition to these larger graphs, users can evaluate the potential risks of their trade in the Future, Volatility and Time sections. In each section, you can analyze how a change in the given variable affects Profit and Loss, Time Value and all the Greek values. With all the functionality that resides within the Strike Detail Sheet, it’s important to take some time to get acclimated with the page and its popups (NOTE: The Strike Detail Sheet can also be displayed as a popup by clicking any Strike Price within QuikStrike). We’re interested to hear about your experience with the Strike Detail Sheet. Get in touch with us via email at info@quikstrike.net or find us on Twitter. We appreciate you reading our blog! 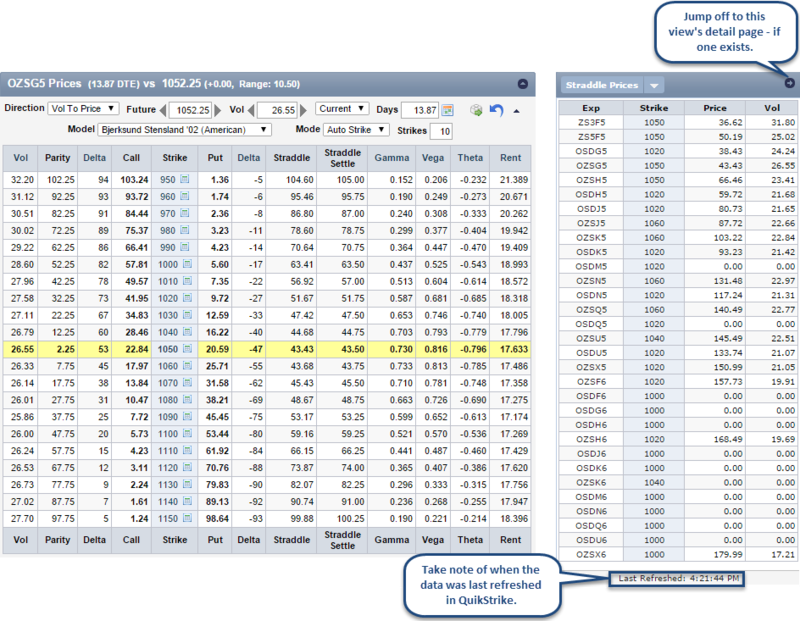 QuikStrike was created to provide our users with fast, easy access to volatility information. The Vol Term Structure page makes it easy to compare at-the-money (ATM) implied volatility levels across all expirations on a single page. 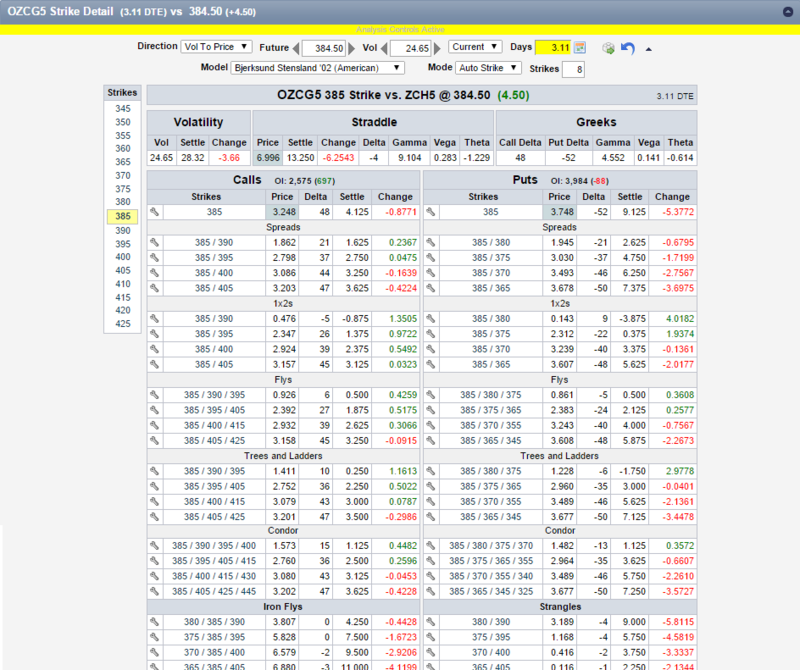 Using the Chart Settings and Expiration Filter dropdowns and the Expiration Table, users can create a personalized ATM implied volatility chart. Click the Chart Settings dropdown to select/deselect each vol term to be displayed on the chart. Let’s look at the American Crude Oil Vol Term Structure page. 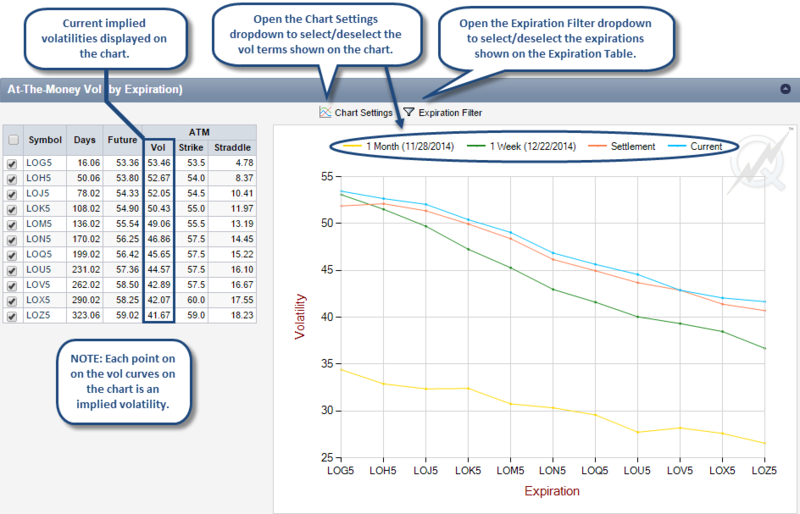 The first thing to note is the Expiration Table that shows which expirations can be displayed on the chart. Toggle the Expiration Groups by clicking the Expiration Filter button. A dropdown will appear that allows you to select/deselect the Expiration Groups shown in the table. 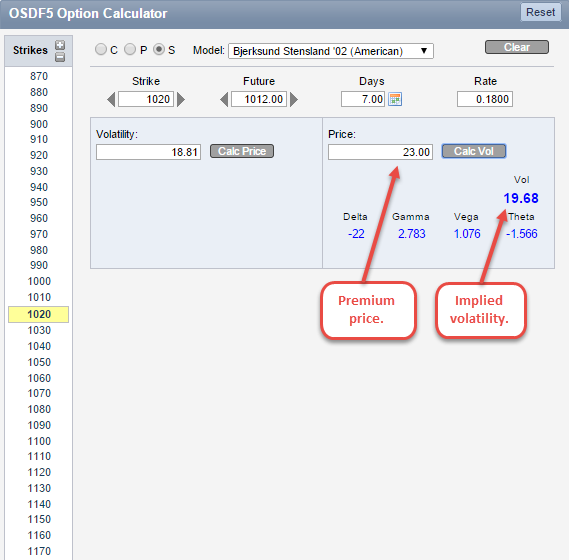 Click the box on the left of each expiration to select/deselect the expiration to have its corresponding implied volatility added/removed from the chart. The Expiration Table also contains Days to Expiration (DTE), Future Price and ATM Implied Volatility, ATM Strike Price and Current Straddle Price columns (NOTE: the expirations shown in the table are listed in DTE order). 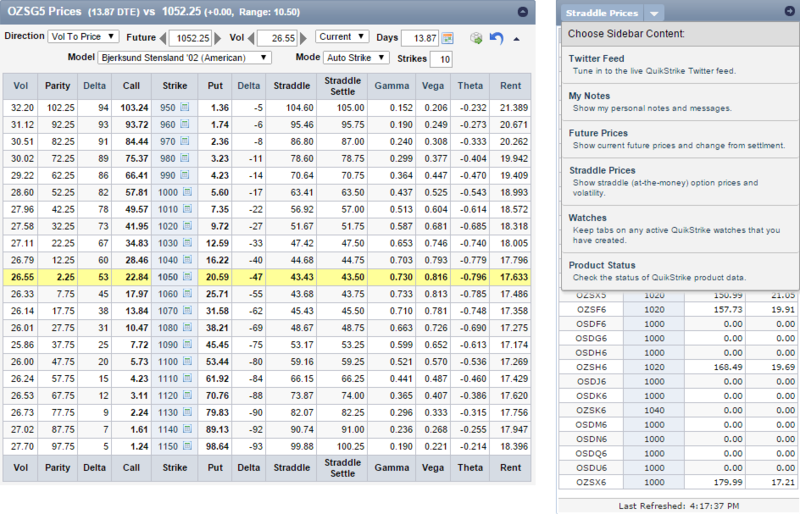 NOTE: You can hover over each point on the curve to view the corresponding expiration and volatility. Many users leverage the Vol Term Structure page to compare only two or three expirations at a time, but the page is designed to build the chart as you please. Share with us how you use the page. Send us an email at info@quikstrike.net. Thanks for reading and please share our blog with others who may be interested. Remember when you initially logged into QuikStrike? The Standard Pricing Sheet was the first page you saw, and that’s not by mistake. The Standard Pricing Sheet, and all the other pricing sheets, are structured in a way that allow our users to manipulate them quickly and easily. It is our goal to give our users access the information they need in just a few clicks of the mouse. As you can see on the table, Daily and Annual Basis Point Volatility columns follow the Greek columns on this particular pricing sheet. You will only see these columns on Interest Rate Pricing Sheets. All other products will have a column for Rent, a measure of the expected daily change in the underlying future based on the volatility of the current expiration, instead. Learn more about the Rent value in the Calcs 101 menu item, which can be found in the QS.EDU section of QuikStrike. It’s important to note how the values on the other rows of the chart change aside from the ATM Strike. For example, analyze how the volatility changed in all the other columns. Since we had an implied volatility lower than the current volatility, the volatilities decreased (by the same amount) for all the other strikes. Notice how the volatility of the 350 Strike on both images is exactly 6.52 percent higher than the volatility of the 400 Strike. Now that we’ve seen what happens to the values in the pricing sheet when volatility changes, let’s try increasing the underlying price one point and going back to the original volatility. Analyze how prices and other values change in a matter of seconds by manipulating one or more of the variables in the theoretical pricing model. Don’t forget that a simple option calculator is next to each strike price on the pricing sheet (NOTE: View the first image to learn how to launch the calculator on the page). 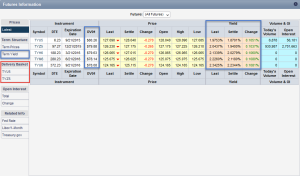 Plug in your own values to find theoretical prices and implied volatilities without leaving the page. What is your favorite part of the Standard Pricing Sheet? 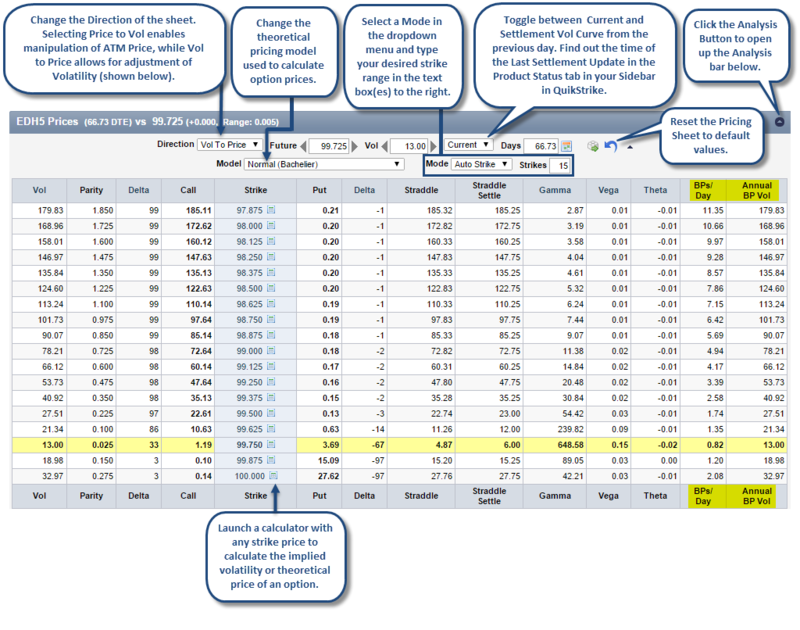 Do you use the Standard Pricing Sheet before executing trades? Share your thoughts with us by sending an email to info@quikstrike.net. Please share this post with others who may be interested. Thanks for checking out our blog! In our most recent post, we referenced the Greek help in the QS.EDU section of QuikStrike. Understanding what each Greek value means and how they are affected by changes in the strike price, future price, volatility, days to expiration and interest rates is imperative in order to trade options successfully. The Calcs 101 tab thoroughly explains how to calculate Delta, Gamma, Vega and Theta, as well the Rent value. Let’s take a look at the Delta page to give you an idea of what to look for on each page. The first thing you’ll notice is the header of the page (Delta) with the Greek symbol next to it. Beneath the header will be the definition and equation for how to calculate the selected Greek value. Becoming familiar with the formula to calculate all the Greeks and the Rent value helps you understand where risk can come from, create expectations for a certain position and reduce the number of surprises one encounters when evaluating the behavior of an option’s price. The strike noted on the page is the ATM strike, the future is the current underlying price and the current volatility is also used. 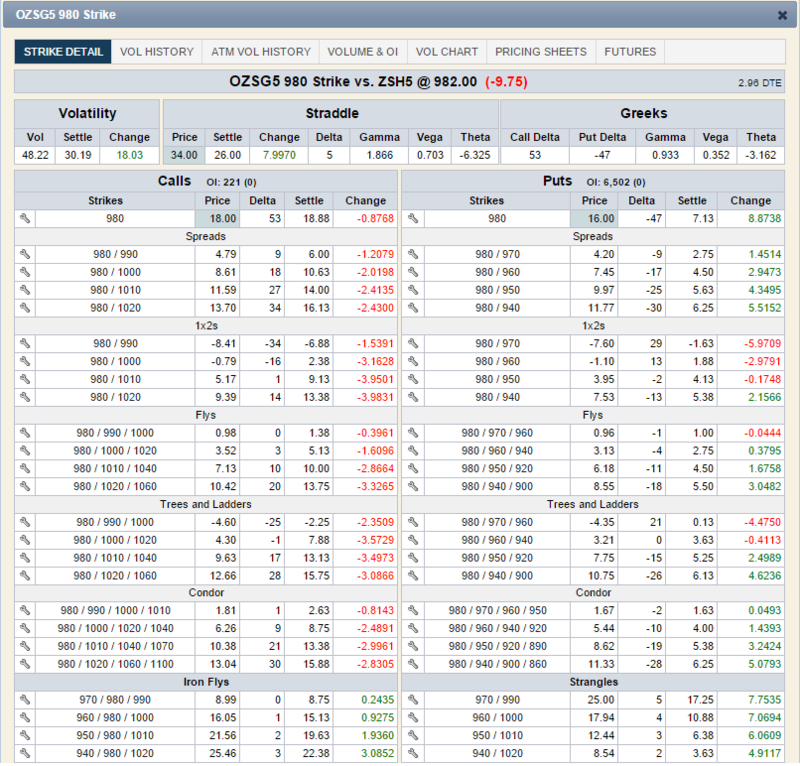 On this particular page, you’ll see the Delta value for both calls and puts, followed by the other Greeks. Note that the strike information shown is always the current ATM strike for whatever expiration is currently selected. In the Example Calculations section, you can use the equation to see how the Delta changes when there is a change in the underlying price. In order to calculate the new Delta, it’s important to understand all the variables (and constants) in the equation. Before reviewing this sample calculation, we need to define the inputs into the equation. We know the Premium is the price you pay for an option and the Future Change is the change in future price. However, you may not be familiar with future and option base and the scale factors. The future and option base are the numeric bases for the fractional portion of the future price. 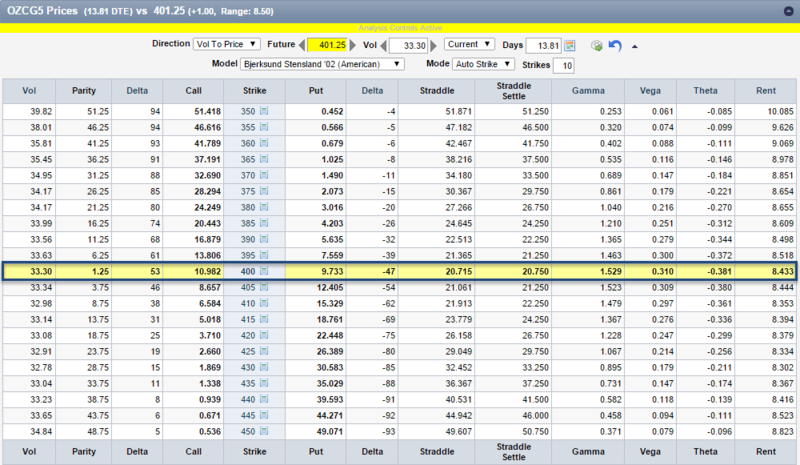 These values only apply for treasuries in which the option base is 64 and the future base is 32. Understanding scale factors is fairly simple; they are used to scale the output of the pricing models for display. To see how scale factors differ from product to product, check out the Contract Specs → Product Properties page in QS.EDU. If you’ve correctly used the equation, you’ll calculate Premium2 to be 2.71. As you may have noticed, this particular Calcs 101 page was for American Crude Oil. It’s important to understand that every page example is specific to the product and has the actual, current ATM information for that product. Let’s take a look at the Calcs 101 page for Eurodollars. Do you notice anything different from the American Crude Oil Calcs 101 page? Remember to look at all of the inputs we plugged into the equation. The Option Scale Factor for Eurodollars is 100, while for American Crude Oil it was 1. Always remember to check to see if you are using the right equation before doing any calculations. Do you find the Calcs 101 tab to be educational? Are there any further questions we can answer about how to calculate the Greeks? We’re here to help. Send us a message at info@quikstrike.net. Thanks for taking the time to read our blog! Part of being a successful options trader is doing your homework. That means following the markets, understanding recent trends and being able to identify where the trade activity is taking place. One way to stay informed is to login to your QuikStrike account and check out the Open Interest page under the Summary Reports tab. Make note that open interest and volume on this page are updated each morning with a preliminary and then a final run at roughly 4:30a CST and 10:30a CST, respectively. QuikStrike makes it easy to quickly sort through the data and find your desired information. However, before diving into the numbers, see the image below to understand ways to customize the page and get a general idea of the page layout. The greater the open interest, the more activity in an option contract. In the Summary section, you can quickly view the open interest for calls, puts and combined total for a given product, as well as the net change from the previous day. Strikes up represents the number of strikes with increasing open interest, while strikes down denotes the number of strikes with decreasing open interest. Monitoring these numbers each day can help support/dispute a hypothesis about where the most activity in an expiration or strike is taking place. Directly below the Summary information are the Ranking columns for the product. 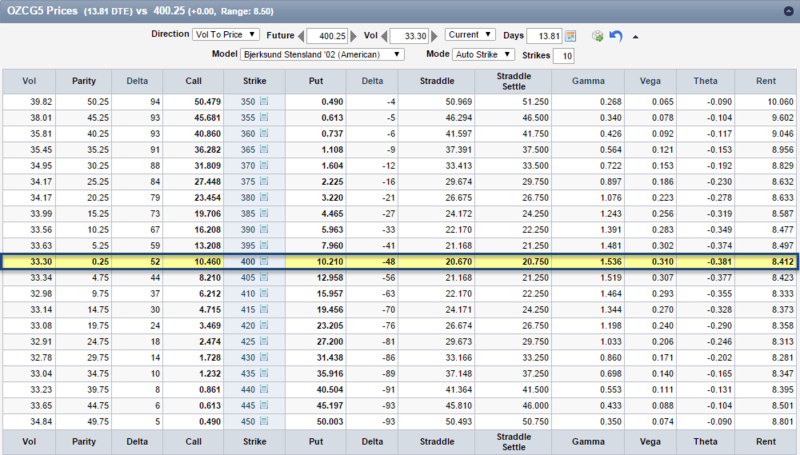 Select either Open Interest, Open Interest Change or Trade Volume and use this section to see the most actives strikes given the chosen filter. We’ll use the 10 Year contracts as an example. The table below displays the Top 10 calls, puts and combined, from all active expirations, ranked according to their Open Interest Change. It’s important to note that you can click on a particular strike price or expiration to dive deeper into the data and find more specific information on each without leaving the page. You’ll also notice that you can compare open interest in the Ranking column to the previous day, as well as view the trading volume. Follow us on Twitter at @QuikStrike1 to see these reports every morning for a wide range of products. How does the prior days open interest and trading volume influence your decision-making? Tell us with an email to info@quikstrike.net. Happy Holidays!